> SAS > Are you ready for Analytic's 3.0? 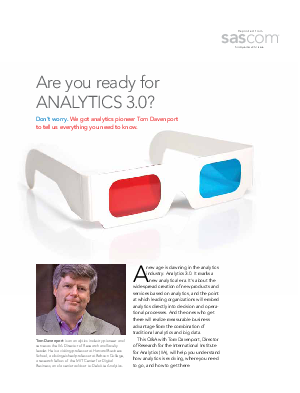 A new age is dawning in the analytics industry: Analytics 3.0. It marks a new analytical era. It’s about the widespread creation of new products and services based on analytics, and the point at which leading organizations will embed analytics directly into decision and operational processes. And the ones who get there will realize measurable business advantage from the combination of traditional analytics and big data.